The cybersecurity specialist's growth isn't going to slow down in 2019. Market research firm Gartner estimates that cybersecurity spending increased 12.4% in 2018 to $114 billion, as growing security risks and privacy concerns forced organizations to spend more money on bolstering their defenses. In 2019, cybersecurity spending is expected to hit the $124 billion mark. One of the best ways to take advantage of this massive opportunity is through Palo Alto Networks (NYSE:PANW). The cybersecurity specialist has been growing faster than the overall industry and has put in a solid performance this year thanks to an uptick in customer growth and spending. The good news is that Palo Alto's performance will only get better in 2019. Palo Alto's pivot from a product-centric company to one that focuses on selling subscriptions has paid off handsomely. Data source: Palo Alto Networks. Chart by author. FY = fiscal year. Clearly the company's operating expenses have dropped, as it now has to spend less money on a key line item -- sales and marketing. Palo Alto spent just over half of its revenue on sales and marketing a year ago, but the number is now under 48%. The higher contribution of the subscription business has been critical to this progress, as the company is now getting more revenue from recurring sources. That's because it costs less to service an existing subscription customer than to go out and acquire a new account for a one-time sale, as the company's product-oriented business must do. Additionally, it is easier to cross-sell new solutions to subscription customers who are already engaged in long-term contracts with Palo Alto. This means that there's still a lot of scope for Palo Alto to lower its cost profile, as 36% of its revenue still comes from product-driven sales. Palo Alto reported a $38.3 million net loss for the fiscal first quarter, which ended on Oct. 31, down from the $63.2 million net loss in the prior-year period. However, a forward price-to-earnings ratio of nearly 29 indicates that the company is expected to get profitable over the coming year. This seems quite possible given the pace at which Palo Alto is cutting its losses thanks to the growth in its client count and customer spending. 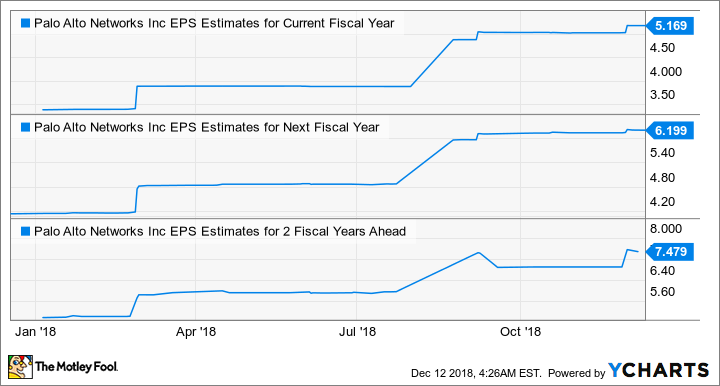 Palo Alto expects fiscal second-quarter earnings per share of $1.21 on revenue of $680 million, which is better than analysts' expectations of $1.20 in EPS and $669 million in revenue. This also means that the company's top line is expected to jump around 25% annually, indicating that the company's growth momentum isn't going to die down. That's not surprising in light of the rapid pace at which the company is adding new customers. Palo Alto exited the first quarter with 56,500 customers, up around 25% from the prior-year period. That's almost identical to the annual customer growth recorded by the cybersecurity specialist in the year-ago quarter. So Palo Alto has managed to keep up its impressive client growth rate thanks to its strategy of expanding into the different niches of the cybersecurity industry through acquisitions. What's more, Palo Alto customers are spending more money on its offerings, as evident from the 45% annual increase in the lifetime value of its top 25 customers to $33.6 million last quarter. Lifetime value represents the amount received from a customer after the money spent on client acquisition and servicing is deducted. The increase in lifetime value means that Palo Alto is successfully cross-selling its solutions to existing customers. Additionally, the new customers getting into its ecosystem have a range of cybersecurity applications to choose from thanks to Palo Alto's series of acquisitions. These factors are showing up on Palo Alto's deferred revenue, which increased 33% annually last quarter to $2.4 billion and outpaced the actual growth in the revenue. Deferred revenue is the money collected by a company in advance for services to be rendered later. This metric is recognized on the income statement once the services are actually delivered. So the rapid increase in deferred revenue means that Palo Alto is securing long-term growth as its customers enter into more lucrative contracts. Palo Alto Networks stock has lost a lot of ground in the past three months thanks to the broader weakness in the technology sector, but the company's latest report shows that it can rise once again thanks to the several factors listed above. Not surprisingly, analysts expect Palo Alto's bottom line to increase at terrific rates for the next two fiscal years as compared to last year's EPS of $3.99. Palo Alto looks like a solid bet going into the new year, as it trades at 36 times next year's earnings, which represents a significant discount to the 100x industry average multiple.